The annual Eddie Gold Trivia Contest at the SABR Convention is for all baseball fans. Every convention attendee is welcome to test their knowledge against SABR's best! The Trivia Contest is inclusive, accessible, informative and, above all, interesting. You'll certainly be impressed by the depth of knowledge of fellow SABR members, but you might also be impressed by your own. We hope you'll participate. We steadfastly maintain that there is nothing trivial about baseball trivia. Come watch SABR's best as they try to answer questions that are presented in ascending difficulty. The early-round questions will be at a relatively easy starting point, while the late-round questions, though more difficult, will still interest casual fans. 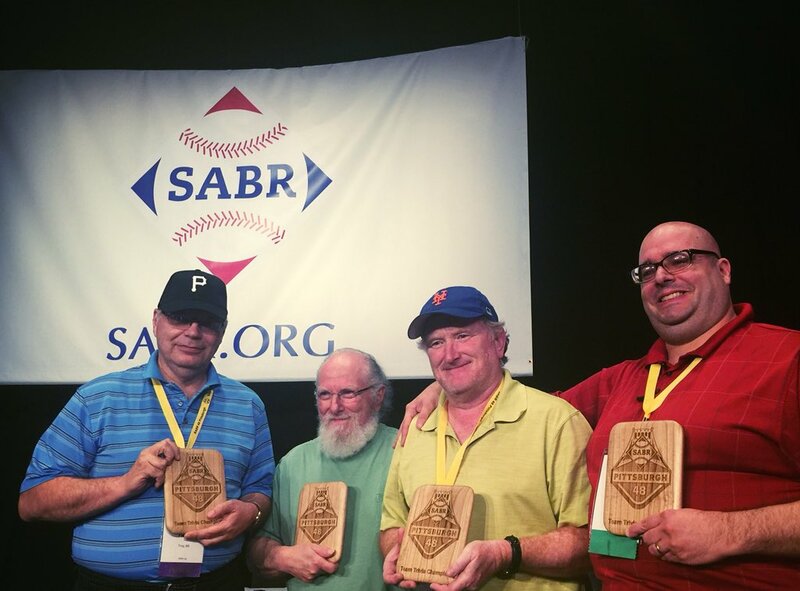 Who will win the next SABR Trivia Contest? Come watch to find out. How do you enter? Click here to view the Trivia Contest Guidelines for SABR 46. Show up for the preliminaries, usually held on Thursday night, and follow the directions given. The preliminaries are a written test. (Want to study for the test? Check out an example of the written test from SABR 37 in St. Louis. The answers can be found here.) There are separate tests for the Individual competition and the Team competition, and you must decide beforehand in which competition you will participate. The top four teams will compete in the semifinals, with the Individual and Team Finals usually taking place on Saturday evening. Here are the past winners dating to 1982. Scroll further down to find a list of the top all-time champions (individual, team and total). If you can help fill in the gaps or have any corrections, please contact Jacob Pomrenke at jpomrenke@sabr.org. Special thanks to Mark Armour and D. Bruce Brown for helping to compile this chart. For more SABR convention history, click here.